Yesterday I woke up in the Great Smoky Mountain National Park and headed to the Oconaluftee Overlook along US-441 near Newfound Gap. This viewpoint is one of the classic Great Smoky Mountain scenes and it certainly didn't disappoint. 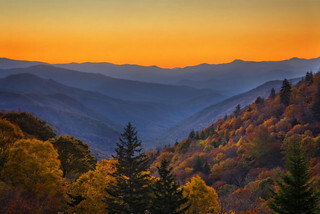 The layers of mountains in the distance, combined with the changing colors of Autumn leaves in the foreground. An early morning fog hung over the the valley that stretches into the distance towards the Blue Ridge Mountains of North Carolina. Truly gorgeous scene and hopefully my image does it justice.